Razor bumps are essentially ingrown hairs that cause inflammation to the surrounding skin. Medically known as pseudofolliculitis barbae, shorn hairs curl back into the skin, triggering an immune response in your system. Your body actually sees the hair, or at least that portion that has curled back into your skin, as a foreign object. This produces an inflammatory reaction that results in the bump. Exacerbating the problem is the tip of the hair left sharpened after shaving. 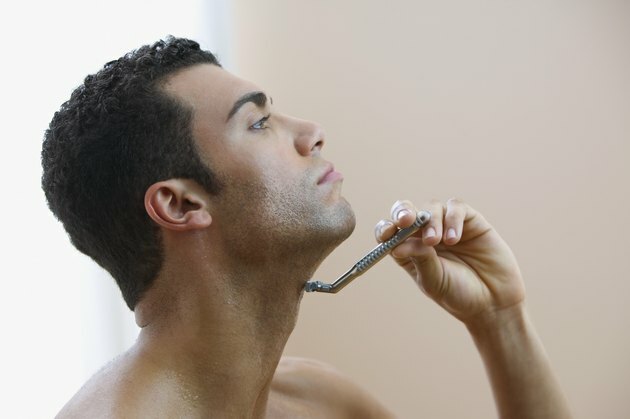 Besides never shaving again, there are methods to rid your neck of these unsightly razor bumps. Take a hot shower prior to shaving. The heat and moisture from a shower softens the beard and opens the pores, which can help to prevent the formation of razor bumps. Massage a shaving gel into the areas of the face and neck you plan to shave. Use a gel over a cream to help lubricate the blade of a razor, cutting down on friction and the curling back of the hairs. Run the razor with the grain of your beard. To run the blade with the grain of the beard, you're shaving in the direction that the hairs grow, which doesn't give as close of a shave. Closer shaves are more apt to lead to hairs curling back into the skin and forming razor bumps. Use light strokes as you shave your beard. Pressing the head of the razor gives a closer shave than simply running the razor along the skin. The closeness of the shave can cause the hairs to curl back. Rinse all the gel from your face after shaving, and apply a moisturizing aftershave. Not only will this soothe the skin, but it can keep the hair of your beard soft, even in its shorn state. Apply a warm, moistened washcloth to the areas of the skin affected with razor bumps. This can soothe the irritation and may help to open the pores enough to allow the hairs to uncurl from the skin. Use glycolic acid ointment. This can be applied to the skin the night before shaving to exfoliate the skin and reduce the chances of razor bumps. Spread a cream directly onto the razor bumps. Hydrocortisone can relieve the inflammation and improve the condition as well as the appearance of pseudofolliculitis barbae. You can also talk to your doctor about a prescription for tretinoin or adapalene. Both of these medicated creams are derivatives of vitamin A. Try an oral medication of tetracycline or erythromycin. These prescription drugs can lessen inflammation and irritation, improving the appearance of the skin. Some men are able to remove facial hair with a depilatory, which is a topical cream that chemically detaches the hair from the follicle, providing smooth skin. Due to the nature of the product, it may lead to skin irritation. Use a single-edged razor. Multiple edges can cut the hair too close to the skin, resulting in curling back. Consider using an electric razor, especially one that has an adjustable setting. Many electric razors are adjustable, so you can keep the shave from getting too close to the skin. If the hairs are left a bit longer, they aren't as likely to curl back into your skin.